Have you ever heard of the five love languages? It was a really popular book back in the 90s, or at least it was in the church circles I was a part of. The book is designed to explain the five primary ways people give and receive love–physical touch, acts of service, gifts, words of affirmation, and quality time. The idea is once you discover your love language and the love language of those around you, you’re better able to communicate your love to them. The concept makes a lot of sense to me, but I think they should add a sixth love language and that’s food. It probably comes as no surprise to anyone that one of the primary ways I like to give and receive love is through food. If a friend has had a death in the family, my first response is to bring food. If they’re getting married, I’ll throw them a shower just so I can make a bunch of food. New baby? I’ll shower you with meals until your freezer cries out for mercy! One of my favorite ways to show the Mr. I love him is by bringing him his favorite foods. I love surprising him with a package of Milano cookies (his favorite! ), and I find it hard to resist picking up a specialty beef jerky for him when I come across them. And more than buying his favorite foods, I love making them too. 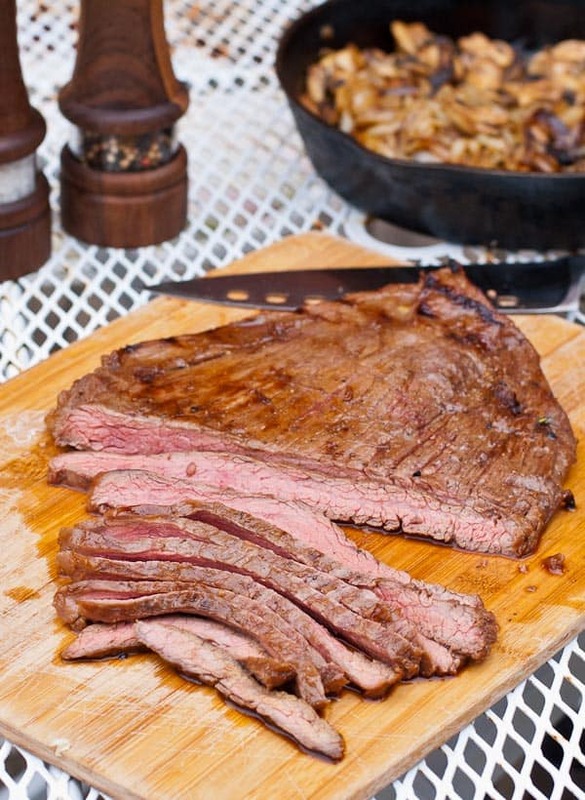 And this Grilled Flank Steak is way up there on his favorites list. I don’t know too many guys who wouldn’t flip over this combination of juicy marinated steak, sweet onions, and mushrooms. And truthfully, I don’t know too many girls who wouldn’t abandon all of Emily Post’s rules of etiquette and dive into this head first. Beef is often my go-to when I want to prepare something quick and filling that I know the Mr. and I will both enjoy, but this was my first time working with flank steak. I’ve always been intimidated to grill steak, but I can tell you after this experience, I’ll be doing it a lot more often. The trick to a great flank steak is to marinate it then grill over high heat until browned on the outside but still nice and rosy in the center. The marinade I chose takes about five minutes to throw together and results in a juicy, ultra flavorful cut of meat. The other trick? Always, always, always let the steak rest for at least 10 minutes before slicing. This applies to any steak, and is the key to keeping moisture in the steak rather than all over your cutting board. Now that I know how easy this flank steak is to prepare, it’s going to be making a lot more appearances on my menu plans. The rest of the meal is also prepared on the grill and is mostly hands off. Since the steak only takes about 10 minutes, I like to start with the caramelized onions. Did you know you can cook just about anything on the grill if you have a cast iron skillet? I just put my cast iron skillet right on the grates and let the onion cook down for about 15 minutes before adding the mushrooms. In 20 minutes they’ll be soft, sweet, and ready to be piled on your sandwich. 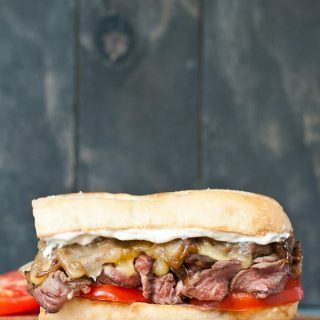 To finish this sandwich off, I like to add some white cheddar cheese (swiss would also be good) and give it a few minutes under the broiler just to get nice and melty. The last surprise in this flavor extravaganza is a generous shmear of horseradish mayonnaise. I simply stirred in a little creamed horseradish to my plain mayo, but feel free to use your favorite spread instead. If you’re looking for more ways you can share the love with beef, check out The Beef Checkoff’s Pinterest board and follow them on their website, Facebook, Twitter, and Pinterest. You can also scroll below the recipe to find four more delicious ways to say “I love you” with beef! Place the steak in a large ziplock bag or baking dish along with all the marinade ingredient. Toss well to coat. Refrigerate for two hours or overnight. Remove the flank steak from the fridge and allow it to come to room temperature. In the meantime, place a cast iron skillet on the grill, and preheat it to medium high heat. Add the butter and 1 Tablespoon olive oil to the skillet. Add the onion and pinch of salt and toss to coat. Put the lid on the grill and let the mixture cook for 15 minutes, stirring about every five minutes. Add the mushrooms and an additional Tablespoon of olive oil to the skillet and cook an additional 5-10 minutes or until onions are soft and sweet and mushrooms are golden brown. Remove the skillet from the grill. Meanwhile, place the flank steak on the grill over the highest heat source and grill for 4-5 minutes per side for medium steak. Remove to a plate and allow to sit at least 10 minutes before slicing. Preheat the broiler to low heat. Slice the baguettes in half and toast them if desired. 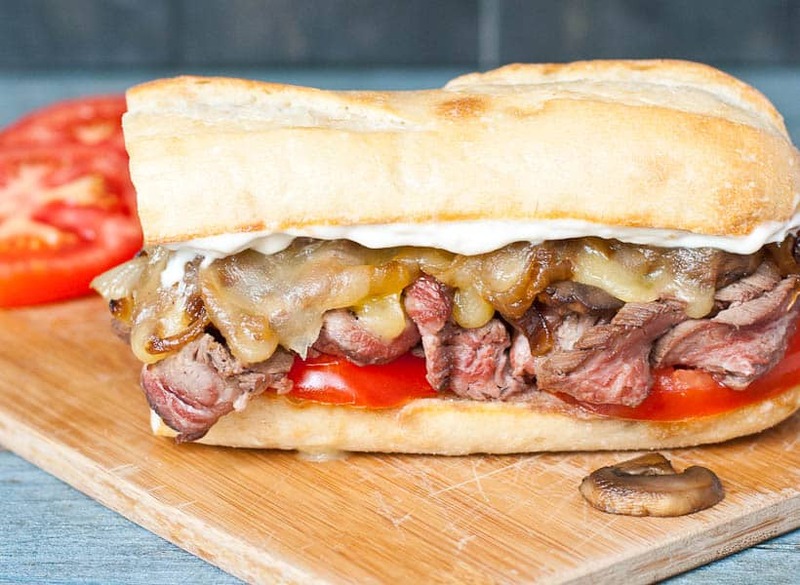 Layer each sandwich with the steak, the mushrooms and onions, and then the sliced cheese. Place them under the broiler for 3-4 minutes or until cheese is melted. Meanwhile, in a small bowl whisk together the mayo, sour cream, and horseradish. 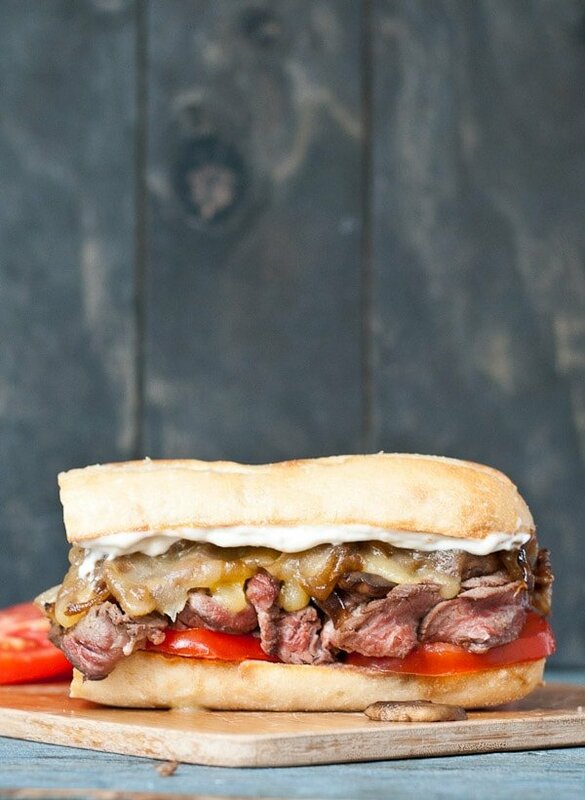 When the sandwiches are done broiling, spread the top half with mayo mixture and add sliced tomatoes. Sandwich and serve. 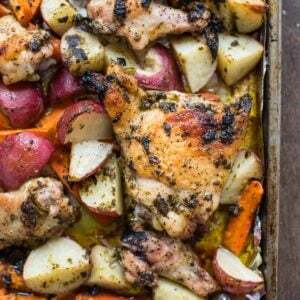 My boys will go crazy for this recipe! LOve it!! Freaking amazing sandwich!! I’m drooling…. 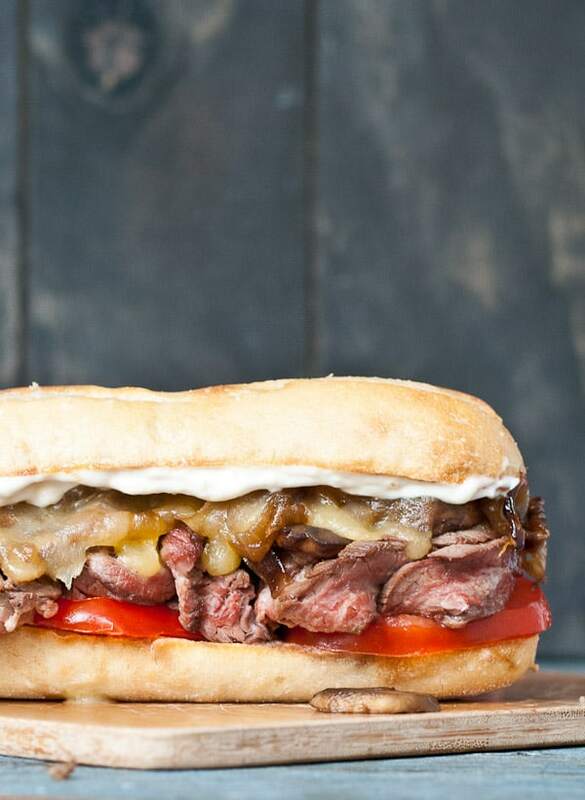 Be still my steak loving sandwich heart! You’d win anyone over with this beauty! These look absolutely amazing, Courtney! I so want a bit of one this very instant. Thanks Melanie! I wish I could give you one! I’m hear you, Courtney on spreading love through food! These sandwiches look “lovely” to me! Oh and I’m with Will on the Milanos, too! 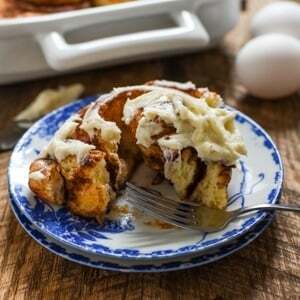 You say; add mayo, add sour cream, add creamy horseradish sauce. creamy horseradish sauce Already contains sour cream and mayo. So you say in addition to the readymade creamy horseradish sauce, add to it sour cream and mayo. Sounds like you have a pre-made horseradish spread or sauce rather than just a creamed horseradish product (where the only ingredient is horseradish). I would just use your store bought sauce as is, without mixing in the other ingredients. Should be delicious!